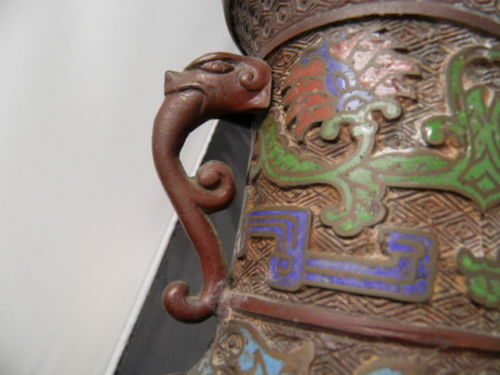 A page featuring Chinese cloisonne from the 1933 N. Shure catalog was featured in a prior blog post. Here's another page from the same catalog, this time depicting Japanese "cloisonne" vases that are more accurately termed "champleve," such as this piece pulled at random from eBay, where similar pieces frequently appear. Although I have never handled one of these vases, they must be fairly sturdy, as a favorite use for them seems to have been converting them into lamps. The little online currency calculator that I use indicates that $2 in 1933 is the equivalent of about $37 today, $3 equals about $55. 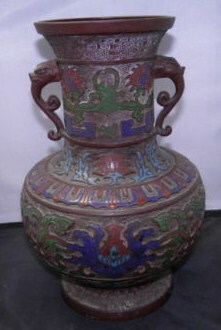 Fredric T. Schneider's book The Art of Japanese Cloisonne Enamel has a color photo of one of these 20th century champleve vases attributed to the Koizumi Company.